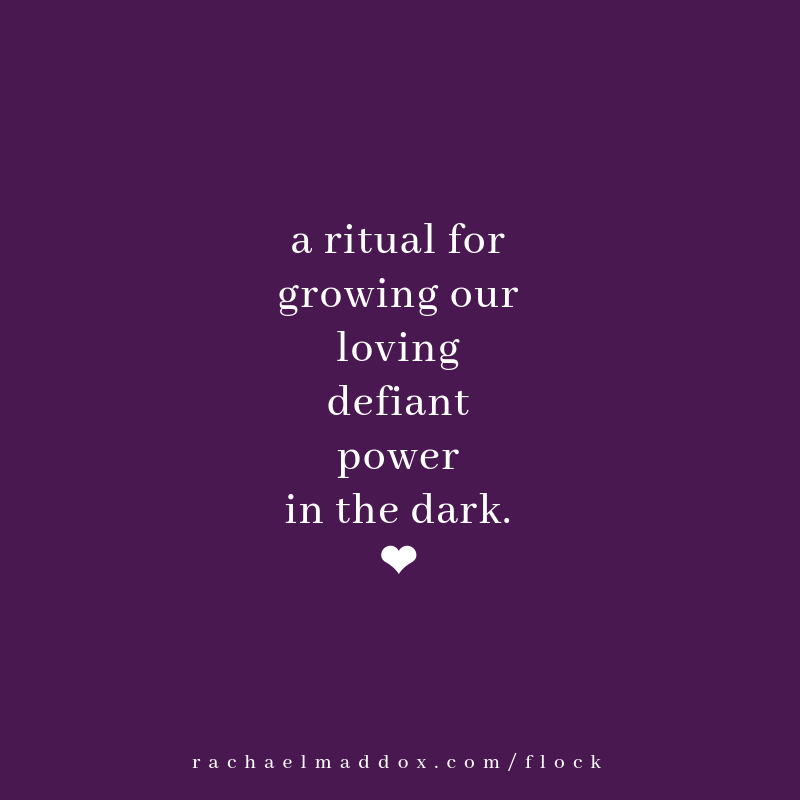 A ritual for growing loving, defiant power in the dark. When the injustice of the world starts to feel like too much, too fast – on the very subjects that trigger our own histories of too much, too fast – it can be hard, like really really really hard, to find the unbreakable core of power and grounding within. It can be hard, like really really really hard, to not self-isolate and collapse, but instead to gather with others to remember our strength and center. So here’s a ritual to help. Because even if we can’t feel it, even if we’re swarming in sensations of emergency and overwhelm, even if we’re flooded with despair, dissociation or depression – that’s not the whole story of our being OR our collective humanity. Ever. Even now. Even amidst all this. Within us each there is always an unbreakable core, a natural blueprint of health, an infinitely wise, potent and loving medicine of creation. And if we can tap back into that unbreakable core when it feels like all is lost, it will help us regain clarity, power and choice. Together. Beloveds, we need our clarity, power and choice in times like these. We need to find and strengthen them together. Righteous rage that moves things forward. Below are instructions + audio guidance every step of the way. We are together, forever ever. PS – If you want more of this, be sure you’re on my mailing list. Way more on the way. This is a ritual you can do alone or together. Instructions for both things are shared in this Ritual Guidance Audio. In a group, including the potluck, this is designed to be about 2-3 hours. Without a potluck, more like 2 hours. Alone, it will take closer to 90 minutes. You can simply begin by pressing play on this audio, and it will guide you through every step of the ritual, including: materials, safety for gathering and participating in this ritual, an icebreaker, a meditation, a boundary amplifying ritual and a closing / warm-down reflection. Below is more written text on each piece. You can read through it, or simply let the audio guide you! When you gather, start with a simple, but powerful icebreaker. What are you here for the sake of? What are you standing for by showing up to this ritual? Give each person just one minute to speak. If you’re alone, journal on this inquiry. Invite people/yourself to get into comfortable positions, and press play on this 12-minute Unbreakable Core Meditation. This will help create safety, resource and capacity in yourself and/or the group. Note: the “meditation” invites you to interact with it in any way you’d like: eyes open or closed, moving or still, doodling or going deep into the recesses of your body. Second note: If this meditation brings up emotion for you, that’s okay and normal (even if it doesn’t seem to make sense). Please take care of yourself, know you’re always allowed to take a breather from this experience at any moment or time. After the meditation, come on back for a transition into the next phase of things. You’ll begin my simply pressing play on the RITUAL GUIDANCE audio. What are you leaving with? What are you taking with you now? Say your goodbyes, and remember to always ask if someone wants a hug instead of assuming! Please respect whoever’s hosting by not staying past the close of the ritual. If you’re hosting, it’s recommended that you have a clear start and end time for energetic cleanliness. This ritual is designed to be about two hours. I added a potluck (and an hour to the experience) because I wanted to fold in some informal time to connect. I put the potluck in between the meditation and the beginning of the Guided Ritual.